Published on Monday, March 2, 2015. 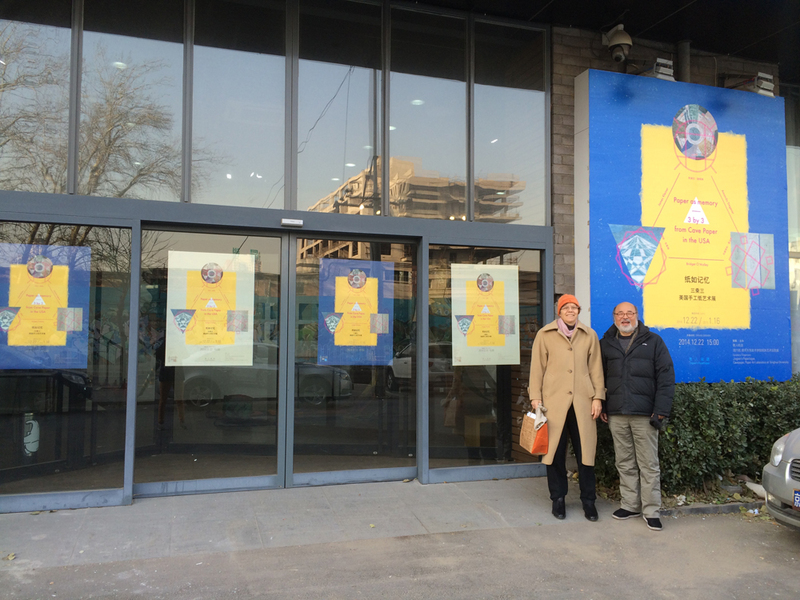 Degener and Jingren standing outside the space housing their "Paper as Memory Cave Paper from the USA" exhibition in Beijing. Amanda Degener, co-founder of Cave Paper, joins us for our first Salon of 2015. Stop by on Wednesday, March 11 up in the ACC Libary at 7:00 pm for a fascinating talk about contemporary Chinese book arts and Degener's recent work, experience, and exhibitions. We were able to catch up a bit with Amanda in the weeks leading up to the talk to ask her a few preliminary questions as part of our ongoing Five Questions series. In reading what you have written about your work, it’s evident that your interest in Tai Chi and traditional Chinese medicine (TCM) are deeply embedded in your artistic practice. What drew you to those two ancient practices in the first place? Practicing Tai Chi and being a hand papermaker are major choices in my life which were quick and intuitive decisions. They picked me and I listened. Ten years ago I saw a dozen people playing Tai Chi in a park and I just knew it was right for me; now I practice everyday. The very first time I made a sheet of handmade paper, it was that “Ah ha” moment. I knew in a flash that from that one sheet of paper that hand papermaking was what I was supposed to do. Papermaking was love at first feel. Often Tai Chi and hand papermaking take me to that quiet inner place, some call it meditation, the creative source, whatever. It feeds my soul. Traditional Chinese medicine (TCM) is a new influence. There is a huge respect for paper in most Asian cultures and a sensitivity toward high-quality, well-crafted things. Through my career as an artist and papermaker, I have been fortunate to be invited to Asia many times. I have taken three trips to Japan and three to China, and I have also been invited to Taiwan and Korea. When you work in these different countries and make friends there, of course you pay attention in a different way. Things like food, their traditions, and even their practice of medicine caught my attention. It is not surprising that when I was experiencing chronic health problems, due to a cold work environment, I turned to traditional Chinese medicine. Many of the basic theories of TCM resonated with the large-scale sculpture I have been making for decades. TCM believes humans are part of nature and subject to its laws. One of the theories is that the elements of earth, fire, metal, water, and wood each relate to a specific vital organ and when they are not in balance, problems arise. Through discussion and observation of a patient, TCM doctors are able to do acupuncture, prescribe herbs, suggest foods, and generally to help the body heal itself. It is urgent to pay attention to our inner environment because that affects how we treat our outer world. It is humanity's attitude, thus our behavior, that has brought on such severe climate change. Balance is possible but I believe it will take more listening, starting on an individual level. Nature is beautiful and humans are part of that beauty. 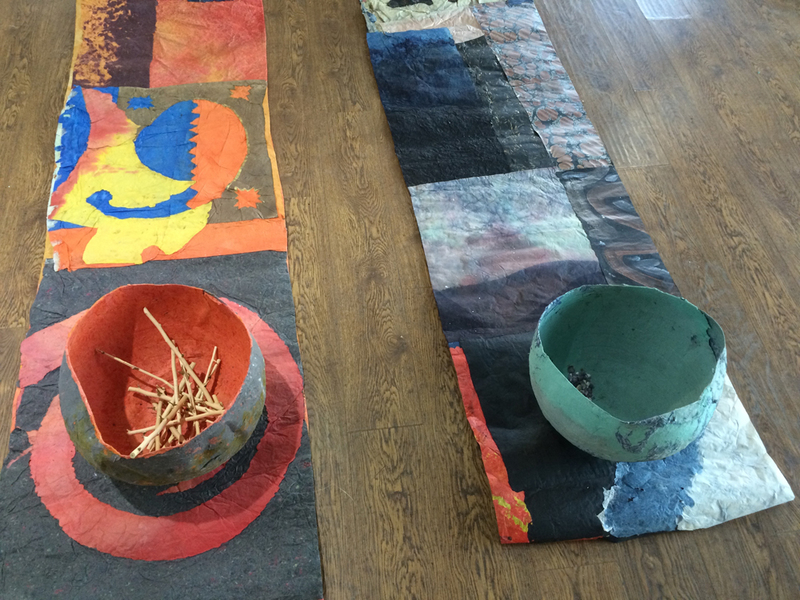 I am inspired by Tai Chi and TCM and I use nature’s materials to make visible to others how I see. If you could master a new craft, what would it be? I love a variety of materials and I think it would be great to work in clay again. As a child I hung out in my mother’s pottery studio, clay felt comfortable, it was home. The first decent sculptures I made were with clay. I kept pushing the material trying to make sculpture larger and larger. After a year's worth of work exploded in the kiln I decided to accept the limitation of clay’s scale. With paper I could make sculpture people could walk around or inside. It is lightweight, portable, and made from recycled materials, so it leaves a small footprint on the planet. They say it takes 20 years to master a craft, I do not foresee 20 years working with clay but it would be fun to go back to it, and see what developed. What was it like to be a founding member of the Minnesota Center for Book Arts (MCBA) and to see where they are now? How did your experiences there help you when you started Cave Paper? My involvement as one of the founders of MCBA—as its first artist in residence, and, later, its first artistic director—had a large impact on the different path of Cave Paper. Cave Paper is a private studio/business capable of making production handmade paper in large quantities. MCBA is a publicly funded arts organization with an educational focus. Although one-on-one teaching occurs at Cave Paper, with our internship program, no hand papermaking classes are taught on-site. I realize your question does not ask this but I will add that being at MCBA directly influenced Hand Papermaking Magazine. My optimism to start Hand Papermaking Magazine as a not-for-profit publication which I co-published for 8 years (now in its 30th year) was from those early years MCBA. There were a lot of founders of MCBA but when we first opened there were only four people who came to work everyday: Jim Sitter, the executive director, Betty Bright, whose focus was exhibitions, but of course she did way more than that, Allan Kornblum running Coffee House Press, and me in the paper studio. Interns were signing up in every area to learn more about book arts and people just kept coming in the door. Most of my three years as paper artist in residence was spent doing demos and chatting with the general public about handmade paper. It was a fun period of time with a lot of positive energy and interest, but it was hard to focus on my own work. In 1987 I moved my equipment to my home studio, established Cave Paper as a sole proprietorship (When people ask when Cave Paper started we use 1994 because by then Cave Paper had outgrown my home studio and became incorporated. ), and helped MCBA’s influential board acquire equipment. Technically, Cave Paper is a for-profit company, however we are like nonprofits in the sense that we are mission driven. We work cold hours, never getting consistent paychecks (or even minimum wage), to provide people with high-quality papers. What are your favorite books on contemporary Chinese book arts? Our recent exhibition “Paper As Memory” included 30 artist books, most of which were letterpress printed. There are a number of reasons why traditional letterpress printing is rare. Will I get someone in trouble if I tell you that I was told the Mao regime melted down most of the small presses? (Small-press printing has a voice.) Another reason is Chinese writing consists of thousands of characters, and it was easier to cut the characters in wood and then print the text as a woodblock rather than cast each character in lead. In Beijing’s Chaoyang District I saw a copy of “Best Books of China 2010 – 2012”* in the studio of book designer Liu Xiaoxiang who had designed this remarkable catalogue. These are people whose career is book design but I also found art books published by such notables as Xu Bing, a noted sculptor who is representing China in the Venice Biennale. His book is a story read, not with text, but sign icons. The title is a dot and right arrow, the figure of a man, a right arrow, and another dot. China is a big country and I have spent most of my time in Beijing so I am just now learning about contemporary books as art in China. What I have noticed is that there are really amazing book designers who are allowed to realize their ideas with the financial and emotional support of their clients. It is easy to find beautifully designed books at normal bookstores that do not cost much money. These books are offset printed on very high quality machine-made paper and the edition sizes are in the thousands. The limited-edition, hand-crafted book is hard to find in Beijing but it is an area of great interest. *It included books designed by Zhou Weiwei, Tao Lei, Hu Ying, Zhao Qing, Ma Shirui, Han qing tang, Pan Xianrong, Qu Minin and Jiang Qian, Chen Nan, Kang Yu, Zhang Guodong and Dong Wei, Zhu Yingchun and Yang Xiaofang, and the list goes on. 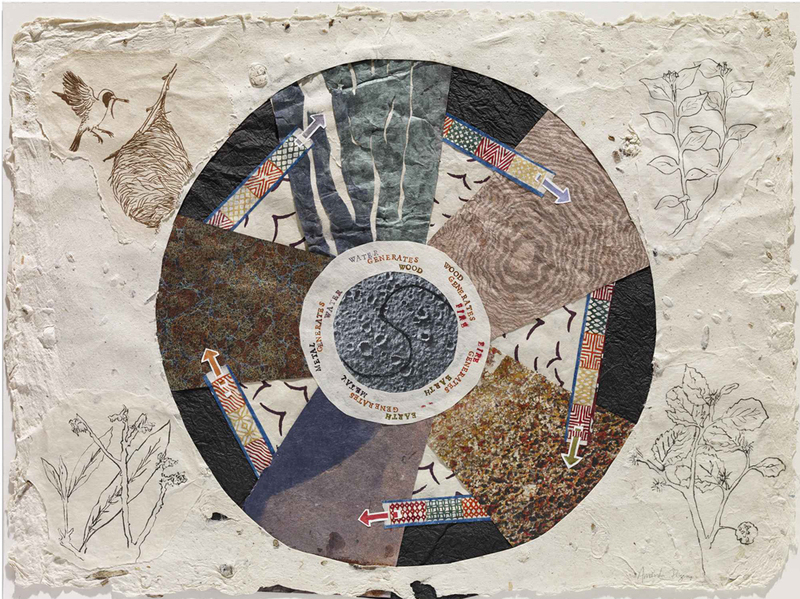 Artist and papermaker Amanda Degener talks about the art of contemporary bookmaking in China at the first ACC Library salon of 2015 on March 11 (detail photo of 5 Elements project taken by Amanda Degener).